Most countries feature some form of government-provided unemployment insurance, but there is an alternative provider of insurance for employees – the firm they work for. This column asks whether the provision of implicit insurance by family firms in particular to employees is a substitute for the provision of explicit insurance by governments. Family firms stabilise employment more than non-family firms, and their insurance provision is greater when the insurance provided by the public sector is less generous. This idea has been confirmed by a recent empirical literature, mostly based on French data, that shows that family firms are less likely to lay off their workers following adverse economic shocks and pay them lower wages (Sraer and Thesmar 2007, Bassanini et al. 2013, Bach and Serrano-Velarde 2010). In a recent paper, we ask whether this idea applies more widely across the world, and especially if the provision of implicit insurance by family firms to employees is a substitute for the provision of explicit insurance by governments (Ellul et al. 2015). The study differs from previous works, which invariably focus on individual countries and thus cannot explore how cross-country differences in public unemployment insurance influence risk-sharing, thereby disentangling demand from supply factors in the provision of implicit insurance by firms. For the reasons discussed above, one would expect family firms to be better endowed to credibly supply insurance to their workers. In addition, workers should value more the implicit insurance provided by their employer when they receive less unemployment insurance from the government. Hence, we take two main questions to the data: Do family firms actually provide more insurance than non-family firms? And does the difference depend on the amount of government provided insurance? We proxy the differences in workers’ demand for insurance with differences in the income replacement rate (the ratio of unemployment benefits to previous salary) across countries and over time. Figure 1 shows the evolution of the replacement rate for the two countries with the largest number of firms in our data for each of the three continents represented in our data. The left panel of Figure 2 displays the within-country average value of the replacement rate. 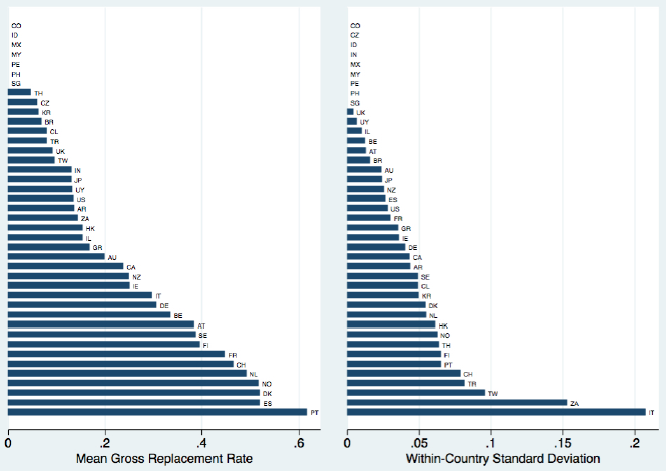 The right panel of Figure 2 shows the within-country standard deviation of the gross replacement rate over time. The figures indicate that countries differ in the amount of public insurance provided and that many countries underwent substantial changes in the unemployment security system, which should have affected the value placed by workers on firm-provided insurance in those countries. Notes: The figure shows the gross replacement rates for the two countries with the largest number of firms in each of three continents: the US and Canada (for the Americas), Germany and the UK (for Europe), and Japan and South Korea (for Asia). Gross replacement rates (GRR) are calculated as the ratio of the unemployment insurance benefits received by a worker in the first two years of unemployment to the worker’s last gross earnings. 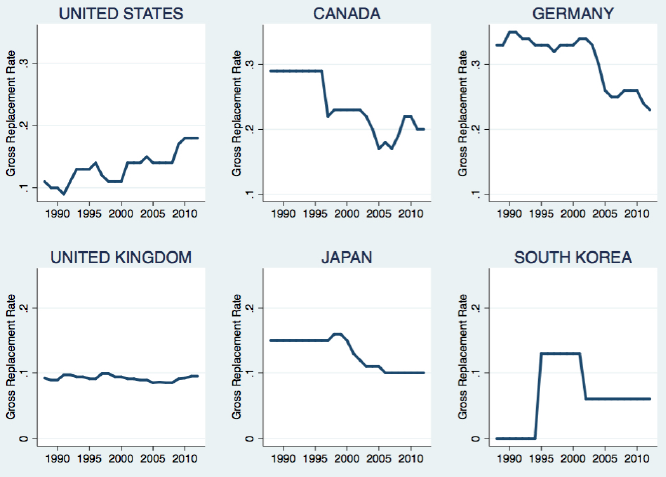 Notes: The figure shows the within-country, over time average (left panel) and standard deviation (right panel) of the gross replacement rates for all the countries in our sample over the period 1988-2012. Gross replacement rates are calculated as the ratio of the unemployment insurance benefits received by a worker in the first two years of unemployment to the worker’s last gross earnings. To measure the implicit insurance provided by firms, we estimate the extent to which they mitigate the impact of sales shocks on their employment level. To this purpose, we rely on a firm-level panel comprising 7,710 listed firms in 41 countries from 1988 to 2012. We measure sales shocks as fluctuations in industry-level sales or as the unanticipated component of the change in firm-level sales, which we also decompose into their temporary and permanent components. We then estimate the elasticity of employment to these shocks and to their temporary and permanent components – the greater this elasticity, i.e. the pass-through of sales shocks, the lower the implicit insurance provided by the firm. We find that family firms do in fact stabilise employment more than non-family firms, and that their insurance provision is greater in countries and periods where that provided by the public sector is less generous, and therefore firm-level insurance is more valuable to workers. For example, in Figure 3 we plot our estimate of the employment insurance provided by family firms against the public unemployment security at the country level. The former is defined as the percentage reduction in the elasticity of employment to firm-level sales shocks associated with family firms. A value of 1 implies that family firms completely insulate workers form shocks. Public unemployment security is the replacement ratio during the first two years of unemployment. There is a clear negative relationship: family firms offer more insurance the less generous the public insurance. 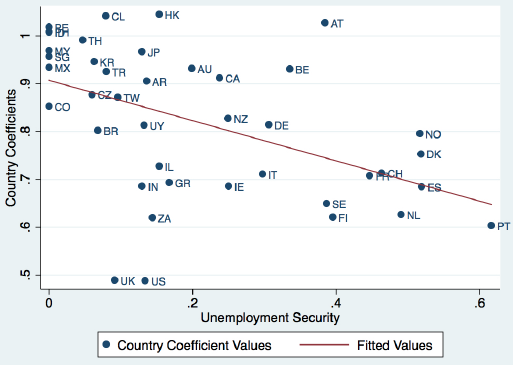 Notes: The variable shown on the horizontal axis is unemployment security in each country as measured by the gross replacement rate, i.e. the ratio between the unemployment insurance benefits received by a worker in the first two years of unemployment relative and the worker’s last gross earning. The measure reported on the vertical axis is a country-level measure of employment insurance provided by family firms relative to non-family ones, estimated as the percentage reduction in the elasticity of employment to firm-level sales shocks associated with family firms. Our results are also consistent with a series of further implications of the implicit contract theory. First, family firms are better able to provide employment insurance in response to transitory than to permanent shocks. Second, when we restrict the sample to distressed firms, family firms behave similarly to equally distressed non-family firms in providing insurance to their employees; hence, if a family firm lacks access to the financial market, its superior ability to commit to insurance becomes irrelevant. We also inquire whether firms differ in their provision of wage insurance. The evidence shows that family firms actually provide less wage insurance than non-family firms. Apparently, the greater trust in industrial relations featured by family firms enables them to provide job security in exchange for wage flexibility, which allows family firms to save jobs in downturns. Besides accepting greater wage flexibility, family firms’ employees also appear to be willing to accept lower wage levels. In our data, wages in family firms are 5% lower on average, controlling for country, industry and time effects. The wage discount obtained by family firms accords with the predictions of the implicit contract theory of Baily (1974) and Azariadis (1975) jointly with the ‘commitment hypothesis’, namely, with the idea that family firms are more credible in the provision of insurance. In the paper, we discuss, and dismiss, the possibility that our results are driven by observable differences between family and non-family firms, as well as by their unobserved heterogeneity. We also perform many robustness checks, which reveal that our results are remarkably resilient to changes in the empirical design and in the definitions of the main variables. We therefore conclude that firms, in particular family firms, are a powerful mechanism of insurance provision to workers. This evidence is consistent with the view that this private, implicit insurance acts as a substitute for the provision of public, explicit employment insurance: a generous public insurance system reduces the comparative advantage of family firms as insurance provider, and leads them to provide less stable employment. Azariadis, C (1975), “Implicit Contracts and Underemployment Equilibria” Journal of Political Economy, 83, 1183-12002. Bach, Laurent, and Nicolas Serrano-Velarde (2010), “The Power of Dynastic Commitment,” Journal of Corporate Finance, forthcoming. Baily, Martin Neil (1974), “Wages and Employment under Uncertain Demand,” Review of Economic Studies 41, 37-50. Bassanini, Andrea, Eve Caroli, Antoine Rebérioux, and Thomas Breda (2013), “Working in Family Firms: Less Paid but More Secure? Evidence from French Matched Employer-Employee Data,” Industrial and Labor Relations Review 66, 433-466. Gamber, Edward N. (1988), “Long-Term Risk-Sharing Wage Contracts in an Economy Subject to Permanent and Temporary Shocks,” Journal of Labor Economics 6, 83-99. Ellul, A., Pagano, M., & Schivardi, F. (2014), “Employment and Wage Insurance within Firms: Worldwide Evidence", CEPR DP10711. Knight, Frank H. (1921), Risk, uncertainty and proﬁt, New York: Hart, Schaffner and Marx,. Shleifer, Andrei and Lawrence H. Summers (1988), “Breach of Trust in Hostile Takeovers,” in Corporate Takeovers: Causes and Consequences, A. J. Auerbach, ed., University of Chicago Press, 33-68. Sraer, David, and David Thesmar (2007), “Performance and Behavior of Family Firms: Evidence From the French Stock Market” 5(4), Journal of the European Economic Association. Baltimore Sun, “Obama's full remarks”, 6 September 2012.